Vertical lines add a sense of tension to an image, probably because we perceive vertical objects such as trees, buildings and cliff faces as unstable in comparison with the calming effect of horizontal lines. 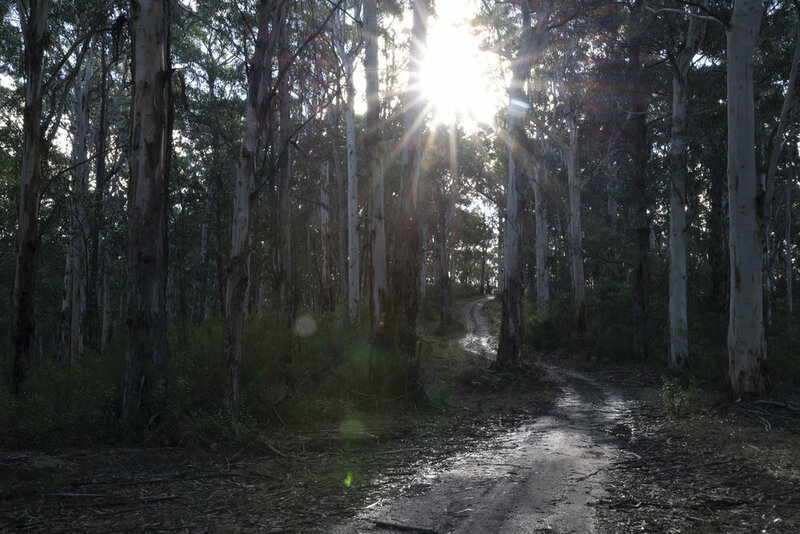 This is one of my favourite 4WD tracks in the Otway Ranges - it's not a difficult driving track (except when it's really wet - which is why it's closed in winter and early spring) but it offers some wonderful views of the dirt track winding its way through the forest. The track runs mostly east-west, which means that there are lots of opportunities to shoot directly into the sun in the late afternoon. Shooting into the sun creates two main challenges: (1) exposure - the high contrast makes it difficult to get the full dynamic range in one shot and (2) sun flare - reduces contrast and creates coloured spots on the image. There's a cool little trick that can reduce the flare. Take two images (or, in this case, two sets of bracketed images): the first is shot normally, the second, place a finger or another object close to the lens to black out the sun. This removes the glare and sun spots and you can then blend the two images together using layer masks in Photoshop. Vertical format images work well with vertical subjects as they emphasise the height of the subject but, in forests, can also be useful in isolating a few trees from the wider view. The light can change quickly in a forest so it's always worth trying different images. but also made a stitched panorama with 5 frames (each a 5-shot HDR). Please feel free to comment below - constructive criticism and debate are always welcome.